Some notes on physical and virtual classroom “clickers” that I’ve maintained in Evernote over the years and shared a few times. Seemed like a good thing to blog about. If you are using a textbook from Nelson or Pearson there might be a chance that you could get the software and base for free from them — but the students would have to pay. ITS’ AV Services also have around 50 of these for sign-out. Uses phones, laptops, etc. and they are always keen to do a demo. Is free for under 40 people but gets expensive as numbers are added. Flexible and free. Waiting for other shoe to drop. What Mr. Clare Sr. uses. It is new and promises to be free, but I have not used it. is new and promises to be free, but I have not used it. answerqwik.com/ I haven’t used it, but they seem serious. Piazza allows for large groups to ask questions and vote up the important ones. It is a very interesting way to get feedback in a large class. It is free and has an LTI integration that the CPI can add to any Isaak/Sakai site. It surprises me how often instructors interested in “simple” polling like the realtime feedback Piazza gives. Long ago I promised myself I’d blog about <a href=”http://evernote.com”>Evernote</a> when I made more than 1000 notes. I broke that record on Friday November 9, 2012 so here’s a quick summary of what Evernote is and what I use it for. Evernote is intended to help people remember everything. While I haven’t achieved that, I’m a lot closer. Evernote is a desktop, phone/tablet, browser plugins and a web application that allows you to capture information from anywhere. The application also indexes all entries so that the content can be quickly searched, including any text in pictures – for example: whiteboards. 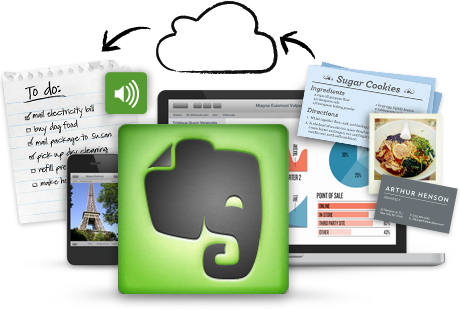 All these collected notes are synced to client/applications on almost any device that connects to the internet – as a lowest common denominator, there is evernote.com. Evernote has a provision for tagging notes, but more importantly it lets you start new notebooks and sub-notebooks. I use this to collect notes about the kids, projects at work, my favourite beers and wines, and other notebooks – including some I’ve shared with others. Lists of things to pack, buy, collect and almost anything else. Pictures of the various medicines and other records my kids have taken – both kids have their own notebook. Planing and document projects around the house – including the summer’s minor fence project and last summer’s major patio project and year before that’s nursery project. The notes are important, but the pictures are handy to travel back and forth from Home Deport with. Records and information about the cars and appliances. I transferred my wife’s recipes etc. from an old laptop to all her new devices – I also have access to the this shared notebook and…. don’t use them. What does Pearson/Google’s OpenClass Look Like? Pearson and Google launched their open class platform this week. Its a Learning Management System (LMS) tied to Google Apps domins. Two subjects often covered by this blog. My short take is that the service looks useful for recreating an isolated web space that respects the need for private on-line areas student privacy and publisher copyright suggest. It’s not as open as I had hoped, but it is more real-world collaborative than any other LMS I’ve used. Also, you can add other participants via their E-Mail address, but no E-Mails are sent and there otherwise seems to be no way for them to access the OpenClass without being part of the Google Apps domina? I had a great time at the Sakai Conference 2011 in Los Angeles. My presentation this year was titled LMS-Based Teaching Hacks: A Collection of Simple Ideas to Tweak Your Teaching Within an LMS. It was well received and the room was standing room only. Much as the development community would use the term, these teaching hacks were intended to be pragmatics solutions about using a resource not as it was originally intended to be used. I shared a collection of simple ideas that can magnify the impact of an instructor’s teaching through the use of an LMS labelling them “Teaching Hacks”. Some of the teaching hacks addressed concerns with student attendance and communications, others with facilitating collaboration and other elements of active learning. Not only were there a lot of good questions, but I also was given some great feedback that I’ve already incorporated. I enjoyed main of the other sessions focussing on Sakai’s future with OAE, it’s strong base with CLE. I was able to engage in some interesting discussions that informed what I’m interested in with Isaak/Sakai at Brock University. The sessions on Turnitin integration with Assignments(2) were useful, and I think the Sakai community is close to addressing a long standing issue with its help files (although not there yet) – I promise to help. I just find the whole idea of a web site that aggregates opinionated tweets and provides bumper stickers about opinions expressed on Twitter to be a novelty.